I always knew that I had a relative who had died in the 1st World War, I just didn't know who or where. Many years ago when I was a teenager, I was watching an episode of Dad's Army in the company of my grandfather. Having spent some time in the Home Guard he would never miss this program, however, during this particular episode he turned to me and said words to the effect that whilst what we were watching was hilarious, wars weren't funny and that he had lost his Dad in the Great War. He went on to tell me that the last time he ever saw his Dad was watching him march off down the street with his rifle over his shoulder. He stopped at the corner of the street, turned and waved. He never saw him again. He also said that no one ever knew what had happened to him. Being something of a hippy at the time and in tune with the "love and peace man" movement, I thought "what a drag", and gave it no more thought and got on with the rest of my life. Ironically, about 5 years later I joined the Army myself, served 20 years and retired in 1992 as a WO2 (RQMS). I served all over the world and developed an interest in touring battlefields. Then earlier this year I received a phone call from my Uncle Harry Roughley who lives in South Africa, he was back in England for 6 weeks and would I like to go and visit him. This I did and after the usual queries of how are you etc, he proceeded to produce a series of documents. He asked me if I knew that my Great Granddad Roughley had died in the Great War? I replied that I had a vague recollection of my Granddad telling me that his Dad had died in the war but knew nothing else. Harry then showed me a scroll printed from the CWGC web site reporting that 25065 Pte William Roughley had died on the 1st July 1916 and as his body was never found, was remembered on the Memorial to the Missing at Thiepval on the Somme in France. It would seem that my Auntie Nancy (nee Roughley), in whose house we were meeting, after retiring from work had bought herself a computer for the express reason of doing some research into the family history. She was aware from speaking to other members of the family, who I didn't know, that their Grandfather had died in the war and that she could get more details if she searched the CWGC website. This she did and eventually found details relating to her Grandfather, William. This was something that immediately grabbed my attention and given my military background, something that I could get to grips with. Being a computer systems engineer and an Internet professional, the first place I began to search was the World Wide Web. I very quickly came across Tom Morgan's Hellfire Corner web site. Tom was most kind and generous sending me details of Williams's short time as a soldier in Kitcheners New Army. He also sent me copies of trench maps, details of the action where William was killed and it was from these that for the first time we realised that William was one of the many thousands who were killed on the blackest day in the history of the British Army, the 1st July 1916, the first day of the Battle of the Somme. I made contact with Tony Sprayson, curator of the Lancashire Fusiliers museum in Bury Greater Manchester. By a supreme irony, as Secretary of the Greater Manchester Branch of the RAOC Association, I had visited the museum some 6 months previously on an organised tour! Tony was able to give me extracts of the action from the Official History of the Regiment. I then discovered the excellent book by Michael Stedman, The Salford Pals. My hands were shaking with anticipation as I rushed home from the library. I searched through the book for any detail relating to William especially from the Battalion Rolls that appeared at the rear of the book. Imagine my disappointment when I found none. From a web site I had been browsing, I discovered a link to Michaels email address so I dropped him a line asking why William had not appeared any where in his book. I think I was a little indignant. Michael was fine though as he explained that William had enlisted after those lists had been produced. All of his time I had been searching for details of a man whose face I had never seen. 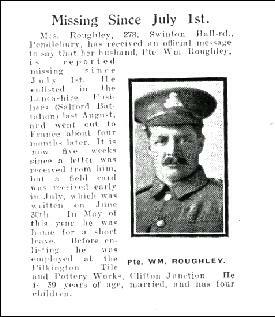 Then one day a breakthrough, I had made contact with the Salford Local History Library and discovered there had been a notice posted in the Salford Reporter in August 1916 reporting William listed as missing since the 1st July. I fervently hoped that a photograph had accompanied this article. Suddenly, there it was, posted to me from the librarian with whom I had made contact. A photocopy of the article and there, looking back at me was a face that seemed to look me right in the eyes and say, "Where have you been? I've been waiting for you to find me". The hair on the back of my neck stood on end. The resemblance to my Grandfather, Jack Roughley, was uncanny. So I now I could put a face to the name. It had long been a desire of mine to visit the battlefields that had interested me, just my son Darren and I. My dear wife, who had always accompanied me, previously, had spent many hours either following me around or sat in the car, bored to tears. She was always moved by the sight of the many headstones in the War Graves Commission Cemeteries and admitted that she had a lump in her throat during the playing of the Last Post at the Menim Gate but as for the rest, they were just fields. Well now we had a reason to visit the area where William had died. 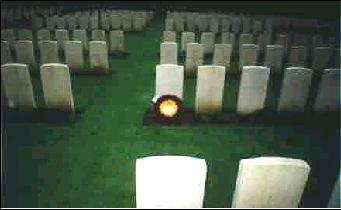 We made arrangements to take a week and visit the battlefields of Arnhem, The Somme and Ypres. Before I record the details of that visit, let me tell you about my Great Grandfather, William Roughley. William was born in 1876 in Houghton Street, Upholland, Ormskirk Lancashire the second child to his parents Peter and Charlotte and a brother to sister Anne. At that time his parents were the landlords of a public house. He came to the Pendlebury area of Salford; we believe to work in the coal mine. He met and married his wife Isabella and they had 5 children, four boys, Edward, Richard, Jack (my grandfather), Harry and a daughter who died in infancy. At the time of his enlistment they were living in Pendlebury and William was employed at the Pilkington Tile works in Clifton Junction, Pendlebury Salford. When Montague Barlow, the MP for the region, started his campaign to raise a Battalion of Infantry from Salford for Kitcheners New Army in November 1914, William did not immediately enlist. He was after all 39 years old, a married man with 4 children. Within a short space of time, such was the enthusiasm for taking the Kings shilling and staying in the same battalion as your pals, they very soon raised 4 battalions who were eventually to become the 15th, 16th, 17th and 18th Service Battalions (1st, 2nd, 3rd and 4th Salford Pals) of The Lancashire Fusiliers. Eventually a further 2 battalions were raised (19th and 20th Service Battalions) from the Salford area. As I say William did not join immediately but for some reason waited until August 1915 and since I began my search I have often wondered why? As a former professional soldier who left the Army at 42, I repeatedly ask myself what drove a married man of 39 with 4 children to enlist? Did he, as the romantics would have it, answer his countries call? Was it a victory of patriotism over pragmatism? As one of those staying behind, was he given a white feather? For whatever reason, enlist he did and he joined the 1st Salford Pals who arrived in France in December1915 where they joined the 96th Infantry Brigade, 32nd Division of the Fourth Army commanded by General Sir Henry Rawlinson. The battalion took its turn in the line in the trenches above the village of Authuille, which lies in the Ancre valley below the Thiepval Ridge. From the 14th to the 27th June 1916 the battalion had been resting and preparing at Warloy Baillon for the big push. They moved to Bouzincourt on the 27th June and on the evening of the 30th June, moved into the line about 300 hundred yards west of Thiepval at about 0100 hrs 1st July. On their left were the 9th Royal Inniskilling Fusiliers of 36th Ulster Division who were to attack the Schwaben Redoubt and immediately on their right, the other attacking battalion of the 92nd Brigade, were the 16th Northumberland Fusiliers. The objective of the 96th Brigade was the village of Thiepval. Supporting the 1st Salford Pals were B and D Companies of the 2nd Salford Pals. A Coy formed the right hand attacking force with B Company in support. C Company formed the left hand attacking force with D Company in support. The distance between the attacking line and its support was approx 800 yards. The Germans had been in these defensive positions for almost 2 years and in that time had strengthened the defences considerably. They had dug deep underground preparing reinforced concrete bunkers and their trenches were considerably stronger that their British counterparts. The British Generals frowned upon such positions as they were hoping for a war of manoeuvre and not an entrenched slogging match. They believed this would cause the British Tommy to accept the trenches as their haven and lose their aggressive attacking mentality. At this stage, General Haig still hoped to get his beloved cavalry into the war, Because of the strength of the German positions, the British Artillery had pounded them with a barrage that last all of the previous 5 days. It was because of this bombardment that the Generals and the troops believed that they would simply be occupying the empty German positions. Indeed as he watched he bombardment of Thiepval from the edge of Avuley Wood, Maj Gen Ryecroft, commanding the 32nd Division, was heard to shout, "My God, all we'll find in Thiepval is the caretaker and his dog". The instructions to the troops therefore was that when the whistles blew to signal zero hour, they were to climb from their trenches and walk across no mans land to their objectives. There was to be no fire and manoeuvre, no right or left flanking attacks, how can you attack to a flank when the defensive line is continuous. There was to be no pepper potting as I know it, where a man gets up, runs 5 yards or so, gets down, rolls a couple of feet away from where he hit the dirt and then provides covering fire whilst his comrades do the same. No, just stand up in a long line and walk towards the enemy! Zero hour was 0730 hrs and shortly before this time the attacking line was pushed forward under cover of the final bombardment until they were within almost 100 yards of the German trenches. At zero hour both A and C Companies advanced on a frontage of two platoons immediately coming under very heavy machine gun fire. 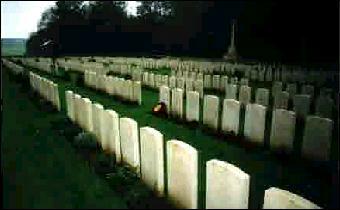 Large numbers of the Battalion became casualties almost at once whilst crossing no mans land. It was reported that some troops managed to reach the German lines and that some actually succeeded in entering the village although this has never been clearly established. This belief was held throughout the day and resulted in repeated efforts by the 2nd Salford Pals to reinforce them and why the Artillery, for fear of hitting their own men, did not shell the village. The Battalion suffered grievously, 470 casualties out of an attacking force of 642. Those who managed to survive did so by either taking cover in the shell holes in no mans land and waiting until dark before crawling back to the safety of their own lines, or by managing to join up with the 36th Ulster Division south of the Schwaben Redoubt. Many men lay in the middle of no mans land screaming out in agony. The German gunners constantly shelled the area making the task of trying to rescue the wounded almost impossible. It is impossible to say what happened to William. Was he shot immediately as the attackers rose to walk towards the objective, was he killed outright? Was he wounded and lay in agony in no mans land whilst his life ebbed away? Or was he lying wounded and killed by the continuing German artillery, which rained down on no mans land and was his body dismembered as a result? We shall never know. What we do know is that his body was never found. All along the front, of the 150,000 men who had gone over the top that morning, more than 57,000 had been killed or wounded. As the guns fell silent that evening, the air was filled with the sound of screaming as men lay in no mans land weeping in fear and agony, calling for help, their sounds of distress rising from the battlefield and haunting those who survived as they shivered and listened. Was this Williams fate? Some of the bodies of the men who died that day were not recovered until November 1916 when Thiepval finally fell to the 18th Division. 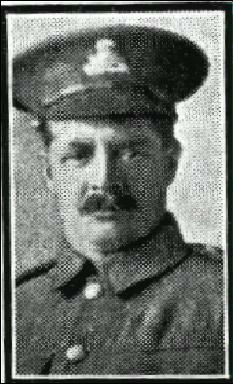 The Battalion was withdrawn from the line and sent to The Bluff on the 2nd July and to Warloy Baillon on the 3rd July. William was officially listed as missing in action and the family never knew his fate. After a while the following item, unfortunately with many others, appeared in the local newspaper, the Salford Reporter. What must the families back home in Salford have gone through? The uncertainty of having a loved one missing in action was the worst of all. Whilst tragic, knowing that your relative had been killed and his body located and identified, at least had some certainty to it. That certainty was denied to Isabella and the 4 children. As my Grandfather said, the last time he ever saw his Dad was watching him march off down the street with his rifle over his shoulder. He stopped at the corner of the street, turned and waved. He never saw him again. He also said that no one ever knew what had happened to him. It was to be a few years before the official verdict on William, as with so many others, was killed in action, France and Flanders 1st July 1916. My Auntie Nancy told me stories of how she used to stay with her Grandma Roughley during WW2 but that William was never mentioned. She recalls seeing a framed picture of him on the sideboard in the house and of another framed sketch of William and Isabella that hung on the wall of the bedroom. One of my distant cousins now has this sketch and I am desperately trying to obtain a copy. The agony was not over for Isabella though, a few years later her eldest son Edward passed away. How this remarkable woman managed to carry on is amazing, she had lost a daughter, her husband missing in action presumed dead and then a son. After discovering all of this, the trip that Darren and I had planned for so long now became something of a pilgrimage. I became a Somme junkie. I read every book and source of material I could lay my hands on. I bought the First Day On The Somme by Martin Middlebrook and it gave such an insight as to what went on during that momentous day. I also bought Somme by Lyn Macdonald and threw it in the bin as she gave only one paragraph to the part played by the 32nd Division and didn't even give the Salford Pals or the sacrifices they had made, the dignity of a mention. We flew out from Liverpool Airport to Amsterdam, picked up the hire car and drove to Arnhem, one of my favourite places. The day and a half we spent there seemed to drag for both of us. Personally I just wanted to get the to area of the Somme battlefield as soon as I could and we left Arnhem a day early. We eventually arrived at Thiepval on Tuesday 23rd October. We had accommodation booked in Avril Williams's Bed and Breakfast in the village of Auchonvillers but I had to go straight to the monument to the missing at Thiepval to find Williams name. I had been to the Menin Gate on a previous occasion so I thought I knew what to expect, a large monument with the walls bearing the name of those who died with no known grave. What I saw took my breath away. Maybe it was because I had a personal interest in it, but I was not prepared for the scale of what I saw. 73077 names adorn that monument. 73077 men who had died and whose bodies were never found. I knew that William's name was on pier 3c or 3d and after taking in the enormity of it all, identified the section I had come for and found his name. I couldn't resist running my fingers over his name. This was the name of a man whom I never knew. I knew he was my Great Grandfather but for the vast majority of my life I had never given him a passing thought and yet I couldn't stop the lump in my throat or the stinging in my eyes. I think I mumbled words to the effect that "whilst it has been 85 years since you passed away William, your family are here to honour and remember you and we will never forget you." We then left to find our billet at Avril Williams's B&B, a place where I immediately knew I could relax and feel at home. We spent a very relaxed evening after a wonderful dinner with copious quantities of wine, with others like ourselves who had come to search out the last resting place of a Great Grandfather or Great Uncle. Darren and I also planned our itinerary for the following day. The car would stay behind, as we would walk the ground. Too many times have I gone somewhere, rushed around in a car and missed picking up the atmosphere of the place. We planned to walk from Auchonvillers to the Newfoundland Park and then in turn to Hamel, Avuley Wood, Lancashire Dump, Authuille, the Leipzig Redoubt, Lonsdale Cemetery, Thiepval village, Thiepval Woods, Connaught Cemetery, Mill Lane Cemetery, Ulster Tower and then the long slog back to Hamel and up the hill back to Auchonvillers. We had brought out with us a wreath from the Lancashire Fusiliers in the traditional Primrose and Claret Minden Roses with the Regimental badge in the centre. We were going to lay this wreath on behalf of all the family but were at a loss as to where to lay it. Should we lay in at the Salford Pals memorial in the village of Authuille or should it be laid at the memorial to the missing at Thiepval? We were undecided and delayed making the choice until we had returned later that evening. After one of Avril's hearty breakfasts we set out, a clear day but with the threat of rain. We were prepared though with well broke in walking boots and waterproof clothing. First stop was Newfoundland Park where the Canadian Government had purchased a section of the battlefield in this region as a permanent reminder of he sacrifices made by the people of that island. We has started out in jovial mood but the mood soon turned sombre as the spectre of war and all its horror showed itself in this small section of the battlefield. Within this park there were 3 battlefield cemeteries, so called because they were the resting places of men who had died on this battlefield. 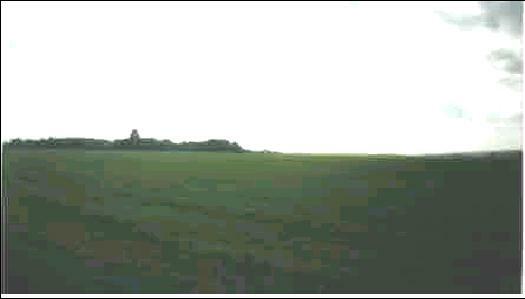 The trenches, shell holes, no man's land and the enemy trenches were all contained within a camera shot. Although now covered in grass, the battlefield remains pretty much unchanged. Was this what it was like in front of Thiepval when William went over the top? We moved on down the hill to Hamel pretty much in silence and deep in thought. After the long stretch to Aveluy Wood and the Lancashire Dump cemetery, we crossed the bridge into Authuille. We were now following in William's footsteps. I said to Darren whilst we walked through the village that our Grandfather could have slept in one of these barns. We moved on to the Lonsdale Cemetery and then to a copse of trees, which was once the Leipzig Redoubt. Having been up to the monument to the missing and wanting as much as we could to follow in Williams footsteps, we went back down into Authuille, turned right and out on the road to Thiepval village and Thiepval Woods. As we left the village we were tempted to follow the track, which forked left towards Thiepval Woods or stay on the road, which runs across the old battlefield between what were the German positions on the right and the British positions on the left. On moving up to their jumping off point the 1st Salford Pals moved through Thiepval woods but as we saw notices which seemed to us to say that this was private ground and to keep out, we stuck to the road. As we neared the junction, which turned right for the monument, straight on into the village or left towards the Ulster Tower, we stopped for a while by the memorial to the 18th Division and looked down the hill towards Thiepval Woods. This was the ground across which the Salford Pals and William must have crossed in pursuit of their objective, Thiepval village, and where William must have fallen. As I looked down the hill at the ground they had to cross, I began to try and imagine the horror of what had taken place here and the futility of attacking across this ground. They had to advance uphill carrying approx 60 lbs of kit, across ground that was as smooth as a billiard table, no cover anywhere except for the shell holes. There was no room to manoeuvre or to outflank your opponent who had occupied that ground for two years and had dug themselves in deep and who, when the barrage lifted, manned their guns and fired into the massed ranks of the Pals. Remember they had been told that they had to walk across no mans land and were expected to simply occupy the abandoned trenches. I thought back to the flickering images I had seen taken from official film, of the 1st Lancashire Fusiliers lying in the sunken road waiting for zero hour. The look of apprehension on their faces. I also thought back to the images of those Tommie's climbing from the trenches and striding across the barbed wire, one poor soul dropping before he even had the chance to clear the wire. Then I thought of William, was that what it was like for him? Looking at the ground again I thought that unless William was one of those men found but unrecognisable and buried as A Soldier of the Great War, Known unto God, his remains may still lie under that ground. Then for a few moments my mind flew off into the realms of fantasy, one day he may be found. After all, didn't they find the remains of 12 Grimsby Chums in one grave recently? These thoughts lasted but a brief moment. The picture above shows the smooth, flat ground which they 1st Salford Pals had to cross and where the majority of the 470 casualties were inflicted in the first 15 minutes after going over the top. After looking over this ground for a while and imaging the horror for which it is now notorious, we turned left at the junction in the direction of Connaught Cemetery, all the while with this ground on our left. I'm afraid that I could not take my eyes off it, thinking that "this is it, this is where it happened". Eventually we came to the Connaught Cemetery and after a few moments we came to a section where there were 3 rows of headstones of soldiers of the 1st Salford Pals. I knew they were from the Pals because of the regimental numbers. Williams number was 25065 and in this section I came across the headstone of 250447 Pte P Canavan, whose number was only 21 before William's! If they didn't join together then they were mighty close to doing so. When we eventually got back to Avril's I went through her extensive library and found Michael Stedman's book The Salford Pals, to see if I could find any evidence that those soldiers from the Pals who they did manage to find were buried in the Connaught Cemetery. Unfortunately I found none, but it made sense to me. Looking at the geography, the cemetery is just around the corner from where the Salford Pals went into action. The pictures above show (left) the headstone of the unknown Lancashire Fusilier who died the same day as William, with the Roughley family wreath laid before it. The picture on the right shows a view of he Connaught cemetery with on the extreme left, the Thiepval ridge in the background, the ground where William died. After laying our tribute we moved on and travelled to Ypres, for the final 2 days of our journey before returning to Amsterdam and flying home. In those 2 days we managed to see what we wanted to seen including Tyne Cot Cemetery and attending the Last Post ceremony at the Menin Gate. My thoughts however remained on the Somme and at Thiepval in particular. Those 2 days had been days of discovery for me. It told me something of where I came from, how I came to be here and of the good stock from which I am descended. I was moved to tears by reading the name of a man whom I never knew but whom I felt had been waiting for me. If he was looking down on me then he must have heard my apology for taking so long to discover him and to pay tribute to him. "Never mind Lad, you're here now, thanks for coming"
Once home I finished my journey of discovery by visiting the Sacred Trinity Church in Salford and the memorial erected by the people of Salford to the Salford Battalions of the Lancashire Fusiliers. On the walls of the Sacred Trinity Church are the scrolls of honour, listing all those men of Salford of the Lancashire Fusiliers who had died in the Great War. I found Williams name listed amongst them. Also hanging in the church are the Kings and Regimental Colours of the Salford Battalions of the Lancashire Fusiliers, which were finally laid up here when the Battalions were formally disbanded. Copyright © Mike Neal December, 2001.